One of many signs posted around campus advertising the forum. What’s going to happen with Sunset taking over the P-Quad? According to Principal Adam Camacho, the P-Quad will house Sunset High School next year. Fences will be put in to separate the two schools. Parking questions were addressed too. Camacho shared that select spots in the Northwest lot on campus (known as the “Bottom Lot”) will be segmented off for Sunset staff and Sunset student parking. There will be a new parking lot on campus near the soon to be finished Arts and Humanities building. Girls basketball losing their home CIF game to Making a Choice Night for incoming freshmen? This topic was addressed by Athletic Director Scott Jordan who stated his distress about such a conflict but is hoping to solve the issue by moving the girls CIF game to Wednesday instead of Tuesday so they are able to keep their home court advantage. WASC tours will be commencing through SDA. These tours will be visiting during the week of Feb. 25, according to SDA Administration. A few special events will be held during that week including another Forum meeting on Monday, Feb. 25, and Homeroom Olympics events will occur during the week. Math teacher Martin Chaker, gave a plug for his new Landscape Architecture and Environmental Design class. A quick show of hands by students showed potential interest in his potential new class. After this, Chaker answered questions on how the class will be graded and stated that it’s a class open to 9-12 graders. James Hrzina, psychology teacher, will be creating another Mental Health Awareness Day sometime in May. Hrzina explained that the NAMI club on campus will be holding a meeting the next late start Wednesday at lunch to brainstorm ideas for a Mental Health Awareness Day. The idea of combining such a day with a wellness campaign was also suggested by a student. As a former SDA assistant principal, I to commend you for continuing the important work of the SDA Forum. 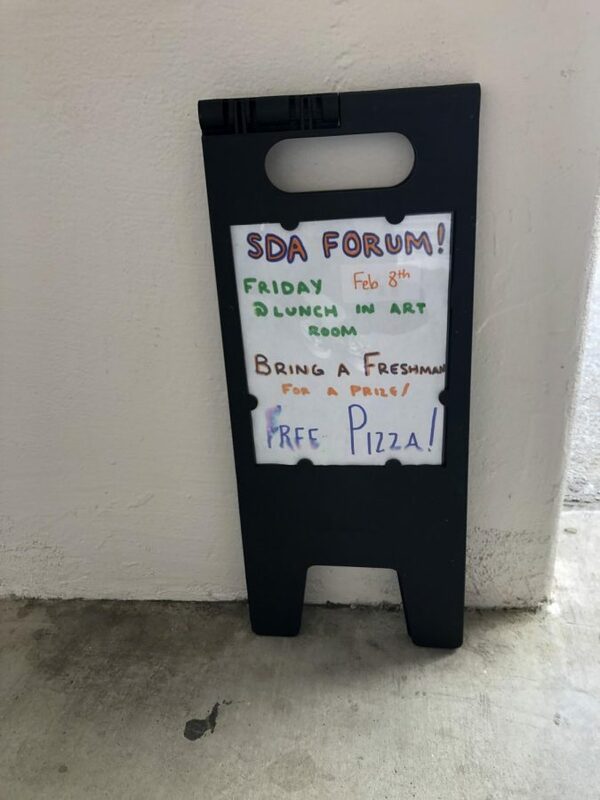 This is an example of the values SDA has always placed on the importance of hearing the voices of all stakeholders. I am so proud of you all.